Health and Safety what’s that? Here we see Milford Jeeps, who lived his entire life in the village and died only recently, driving a load of empty fruit trays, probably to Berrycroft Stores. 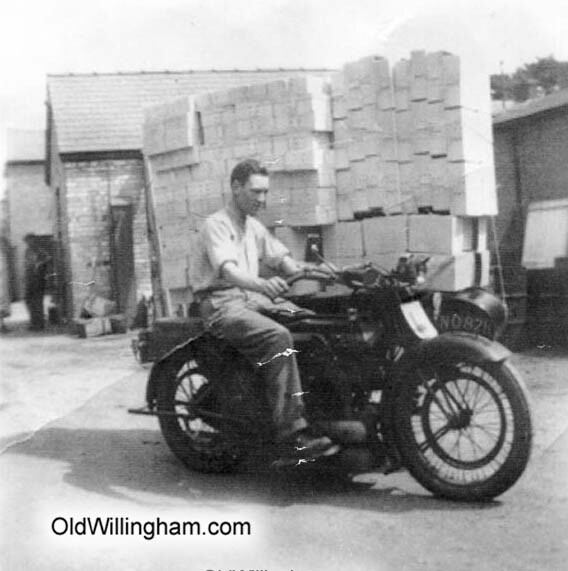 The huge stack of trays beside him is tied to the motorbike side-car! Tens of thousands of these trays were used to transport fruit and flowers to market via the railway at Longstaton and were returned and reused. This picture is probably taken in the 1950s. Milford has no helmet and the motorbike has ‘L’ plates! Somehow he survived to a ripe old age though.